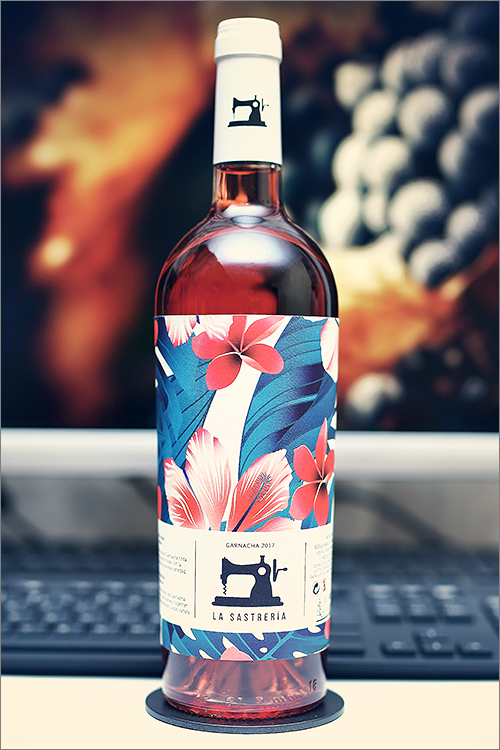 Tonight we are going to review a single varietal rosé wine from Spain made of grenache grape variety – Garnacha 2017 from La Sastreria. Rosé happens when the skins of red grapes (the source of the red pigment) touch the wine for only a short time – some red wines ferment for weeks on red grape skins, while rosé wines are stained red in just a few hours of skin contact. The winemaker removes the grape skins when the wine reaches the perfect color. Nearly any red wine grape can be used to make rosé wine, however there are several common styles and grapes that are preferred for rosé and grenache is one of the most used one. It is used in the most popular rosé wine of them all – the Provence Rosé blend, also, it is the most used grape variety in the northern Spain, where it is called garnacha rosado, but enough theory, let’s move on to the tasting. Deep onion garnet color, with bright copper shades towards the rim of the glass. The nose is strong, filled mostly with red fruit flavours: cranberry, wolfberry, red currant, berberry, red mirabelle, red cherry, wildberry, red plum, red apple and some subtle hints of marionberry. The wine is medium-dry, with high alcohol level, moderate acidity and firm tannin. This is a bold, sharp and quite angular rosé wine, with a firm and muscular profile, as it tastes rough, astringent and fruity. It has a fair overall balance, with a touch of alcoholic warmth showing through towards the end. The wine has a medium-plus finish and a balanced, sharp & crisp aftertaste. This is definitely a fine Wine of Spain and the overall rating says the same, with 89.5 points scored it is right there, among the best wines we’ve tasted so far. Please click on the chart icon on the left in order to get to the wine rating page, where you can find all the wines we’ve tasted to date. Conclusion: this is a rosé wine in its prime form or very close to it – fruity, yet austere and clearly off balance – a bit too sharp and a bit too rough on the plate. We would suggest to drink it now, as long it is still young and beautiful, as we cannot recommend any more bottle ageing, due to its angularity. There are wines that excel standalone, and there are wines that require food pairing, and this one here is one of these. For the best wine and food experience, we would recommend to pair this wine with sweet dishes that are rich in natural acidity or any fat-rich fish, like for example a berry fruits tiramisu or some grilled salmon bruschetta, as the acidity and fat in the dish will cut nicely through all the roughness in the wine. Salud!